A cozy mystery within a mystery – Joyce's mystery and fiction book reviews with some non-fiction too! 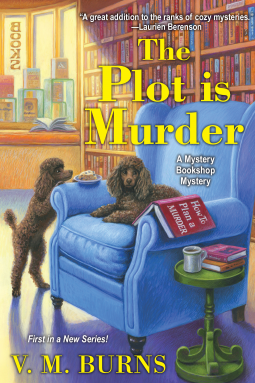 #ThePlotIsMurder #NetGalley I have often had the dream of owning a mystery bookshop. A dream nurtured by stores like Otto Penzler’s and the old mystery bookshop on New York’s upper westside. For me, it will not happen but for Sam it does. In this book, she opens a shop while turning her hand to amateur detection. Sam needs to solve the murder of an unlikable victim who died outside her door. Sam is most ably assisted by her Nana Jo and Nana Jo’s friends. In addition, you also get to read the mystery that Sam is writing. This book is a pleasant cozy to while away some time on a cold winter night.